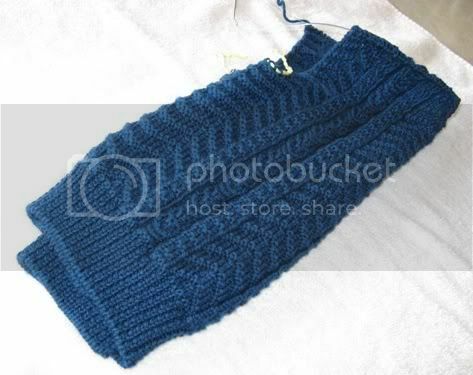 knit in one piece to the armholes, this shows the back and the bottom halves of the two fronts. I love the tubular cast-on, it looks OK in photos (even professional photos in books don't show it off properly), but in person it's amazing. 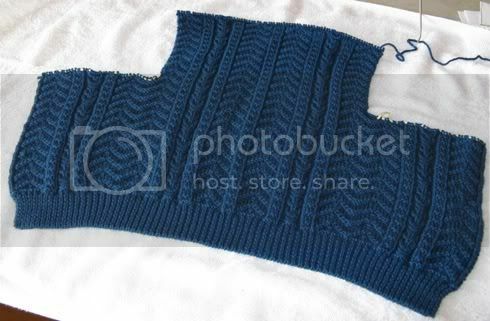 The cables will hopefully pop more after it's blocked but this is a limp soft wool, I'm not sure how it will behave. yarn: Knitpicks Swish DK, 100% superwash wool in storm (I purchased 6 skeins, I'll confirm the number used when it's done). Note about the color: Storm is a little darker but if I manipulate the photos too much to make the color more accurate then detail is lost. It's a beautiful true blue. 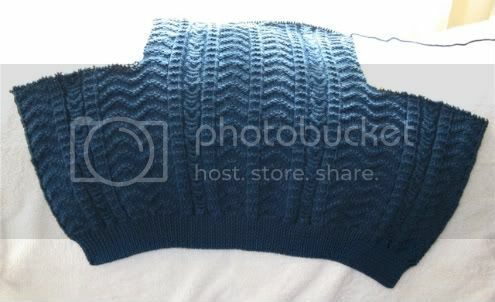 I started this cardigan last year and set it aside when I realized how big it would be, but now I'm in the mood to finish it. Katie Blue Eyes will eventually grow into it.